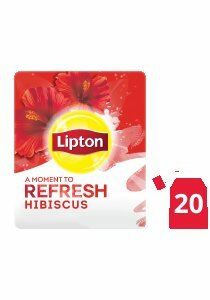 Lipton Hibiscus Tea releases a strong aroma of hibiscus, which will smooth your guests' senses. The tea bags are packaged in envelopes, so you get the same crisp taste and aroma - from the first tea bag and the last. Ambient (Store in a cool and dry place away from direct sunlight and moisture), Max 25°C.